In a food processor pulse flour and butter until resembles bread crumbs. Tip out into a bowl and add yogurt and vinegar. Mix through, a quick knead until a smooth consistency and then pop into the fridge for awhile. Take out and roll to the thickness you want. I did individual tarts, but it could easily be done as one big one. Into the oven at 200C until the pastry is golden. 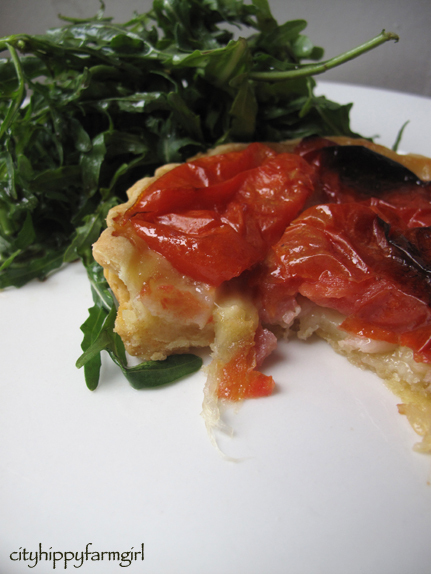 This entry was posted in Connecting with Community, Food Glorious Food and tagged bacon, easy, heirloom tomatoes, locavore, mozzarella, roast tomato tart, roast tomatoes, rocket salad, simple meals, slow food, yogurt pastry by cityhippyfarmgirl. Bookmark the permalink. How delicious does your tart look! Love it! 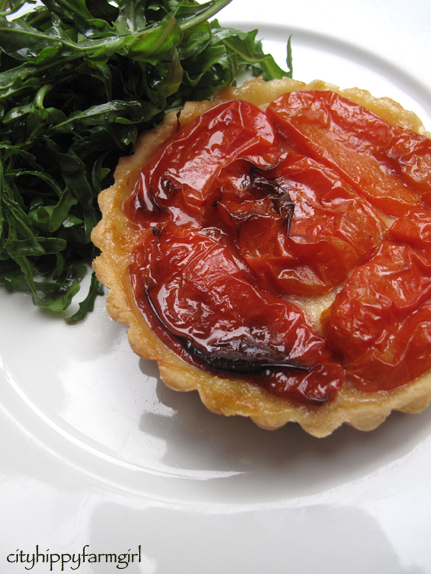 what a lovely tart brydie where you’ve made the most of the last of summer’s fresh tomatoes..
Oh wow. Those sounds absolutely amazing. I’m just drooling just thinking about them! Must get myself some tart pans!! These look so great! Starting to see gorgeous heirloom tomatoes at my local farmer’s market – adding this to my ‘to make’ recipe list! I can get the best fresh mozzarella here. I can do this! Oh I know you can! The mozzarella has never been quite the same here. Cecilia I use that yogurt pastry for just about everything, it’s a pretty versatile beast. How yum does that look! Thanks, it’s on my list. Sounds delicious…lovely flavours! 1…4…who’s counting?! That looks incredible. I’ve never made one of these myself, I shall have to give a frugal version a pop a little closer to summer 😀 Thanks for the inspiration! I am so excited…I have all those ingredients!! A great cooking day on a rainy day lays ahead of me!!Thankyou. I’m not surprised you could have eaten four of them. They look so delicious. Love the idea of yoghurt in the pastry. These would be great for when you have your girlfriends over for lunch. Love the yogurt in the crust, and can’t wait for tomato season to give this a try! oh, can you send some over for breakfast? I don’t blame you, I could eat four from just seeing them….yum!! OK, I’ll trade pies any day. These are brilliant. They look stunning. I love the pile of leaves by the side too – simplicity and elegance and I imagine totally delicious – oven roasted tomatoes are fab! I love how when you roast tomatoes they get sweet and with the cheese. How did you stop eating at just one? I’ve written down the pastry recipe, which looks fabulous! These look delicious and so very pretty! Oh yum! Guess what we will have for dinner tonight now! And i got nice fresh tomatoes at the markets this morning too! This is soo pretty!! And that crust sounds easy enough for me to have a go at it! 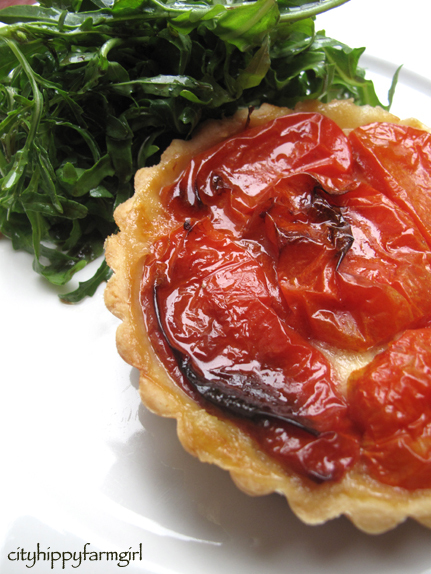 I love tomato tarts, and you’ve just added another level of love with some mozarella! Oooh… You know. Oh. I have no words. I am hungry. Feed me.